Here we have small heat exchanger/ circulator for space heating that we prefabbed to be used with an existing tankless water heater. The living space will be heated with PEX tubing suspended under the floors. For pictures of PEX tubing see Radiant Floor Heating. The PEX tubing is serviced via the manifolds visible on the table (lower left)). 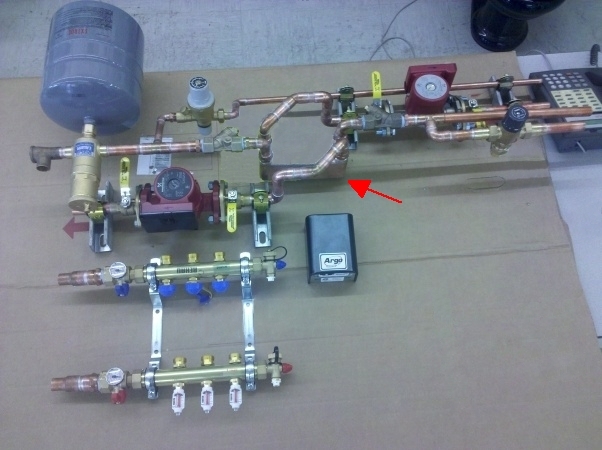 The small hi-efficiency heat exchanger is in the center (red arrow). With this system the domestic hot water has priority and the space heating is accomplished via relay logic after domestic hot water heating is accomplished.